I am quite a yard sale and auction kind of guy. I recently passed a yard sale near my home just this past Saturday (July 12,) and decided to turn around and take a look at their goods. I immediately saw this little clock. I knew it was old and I knew it was special. I picked it up and realized it was a vintage Leather covered Wooden Seth Thomas Alarm Clock. Being a collector of clocks, I knew I had to have it. The price on the clock stated $3.00, however the bevel glass was loose, and I offered $2.00 to the gentleman, to my excitment, he accepted my offer. 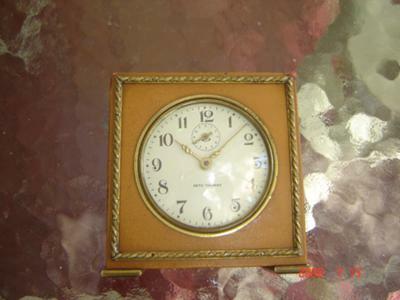 This little clock is a truly high quality piece, from a company that used to be known as the Tiffany of Connecticut. This particular model dates back to 1930 to 1950. The bevel glass and trim along the edge are all brass. The alarm still works and has a wonderful little bell sound. The clock was still marked with the label which reads "Seth Thomas Clock SEVERN-2 Thomaston, Conn. USA "5009"(184). This cute little clock is 3 3/4" tall, 3 1/2" wide and 1 1/4" deep. Once home I disassembled the little clock, discovered a tiny screw which held the glass snuggly against the face had come loose, after tightening it up, the glass is now secure. I then cleaned it throughly, and put it back together. Aside from missing the knob on the alarm on/off, which is easy replaced, the little clock is perfect. Seth Thomas clocks are very popular with collectors. The Seth Thomas Clock Company has a very long and interesting history. You can find out about it by clicking here. On my way to work this morning (5-10-11) I passed a garage sale. Being a garage sale freak I just had to check this sale out, and I'm glad I did for I found a Seth Thomas Severn clock is very good shape with only the knob that sets the alarm time missing. To me, this is no big deal. The clock runs fine and I have it on my desk at work. The clock was priced at five dollars but I figure that I paid about $3.75 for it since I bought some other items and offered the guy ten dollars for the whole lot which he gladly accepted. The only thing that bothers me about this clock is that the price sticker left a bit of glue residue on the wooden case. Could you possibly tell me how I can remove this residue without harming the wood? Thanks! I have this same clock, do you know what it's worth, if anything. Everything works good on mine, nothing loose or missing.